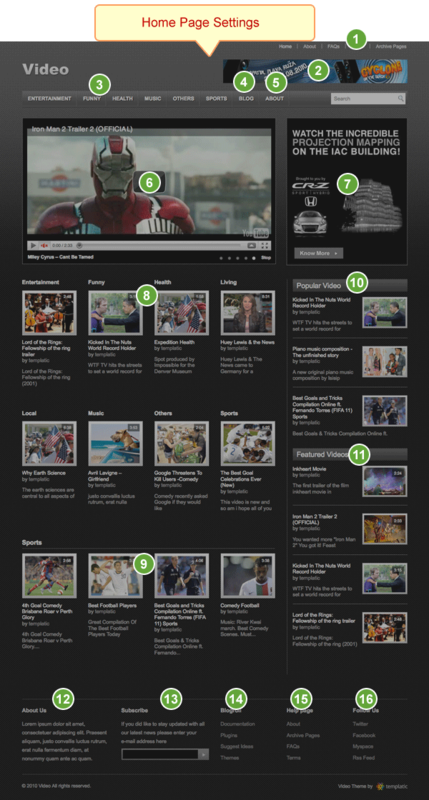 Here is a free wordpress theme for video websites. That’s Video from templatic, which is a cool video wordpress theme, you can create a website to showcase your Videos by using WordPress! With this free video wordpress theme, you can create unlimited video categories, show popular videos, rate videos and share them on social network. This theme is just perfect for Video Blogging. This is an advanced wordpress theme, a little for users who are new to wordpress. 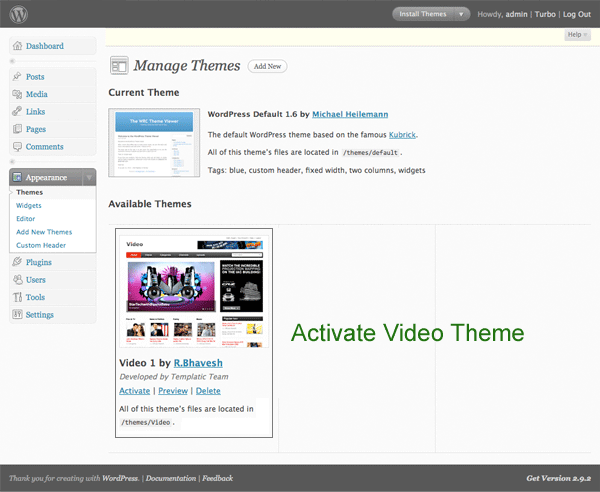 The homepage of the video wordpress theme is completely customizable via custom dynamic widgets specifically built for this theme. This free wordpress theme has an easy-to-use, intuitive control panel that allows you to configure all aspects of your Website without touching the code. Translate this free wordpress theme into your native language! 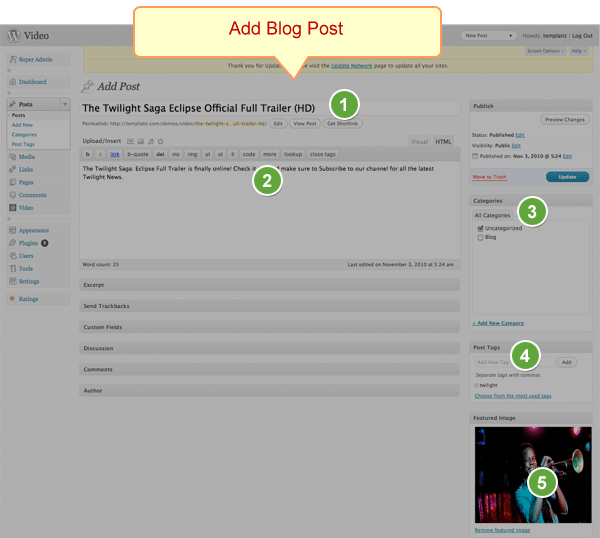 Native translations of all content can be done through the theme’s advanced control panel. Show videos from a particular category and insert your own image which you wish to display in this page. A really cool video wordpress theme, right? Start a Blog and flourish it, afterall Blogging is a fun.Blog detail page is even more special. Now you can make an image gallery also and related posts appear beneath the Blog post. 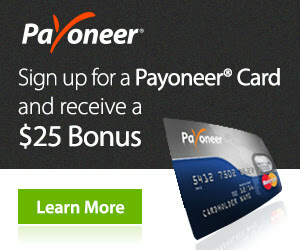 This theme used custom taxonomy in this theme’s development. 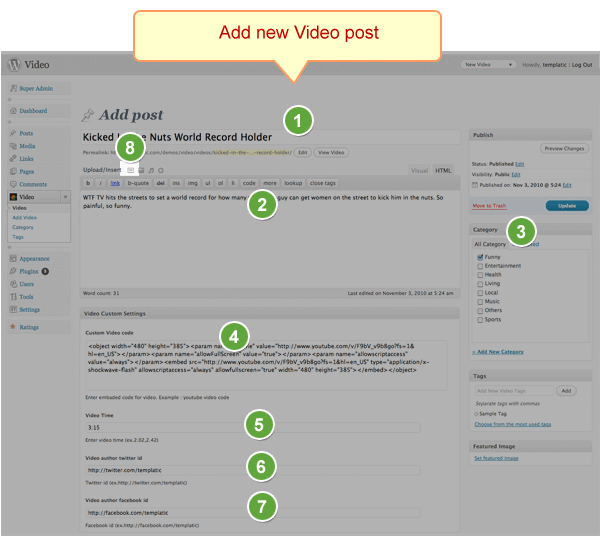 Now your Blog post and video post will remain different, all the time. 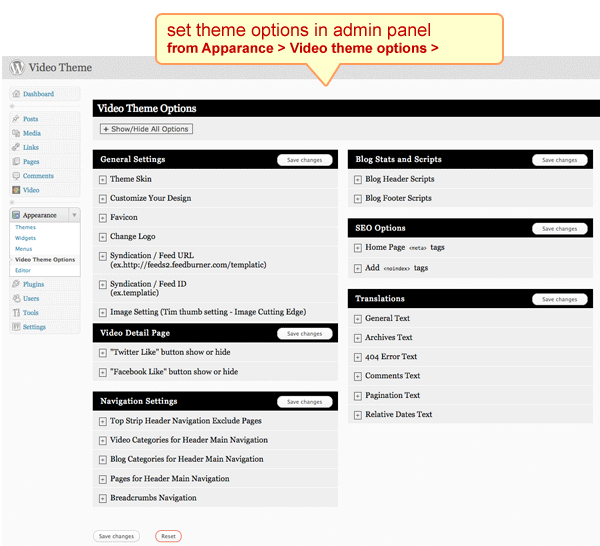 Upload Video theme to wp-content/themes directory and then activate the theme from your WordPress Admin panel > Appearance > Themes page. Click on “Yes Insert Sample Data” to insert the sample, as shown in the live demo. Go to wp-admin > Appearance > Video Theme Options page and take a thorough look at all the flexible options available to you. Do the settings as per your wish and then save them. Top Navigation: This can be configured from Appearance > Video Theme Options > Navigation settings > Top Strip Header Navigation Exclude Pages. Also this area is widgetinzed area. Go to Widgets > “Top Navigation” and you can insert cusotm menu also. Advertisement: Go to Widgets > Header Right Side Advt and insert “PT Advertise” widget here. Advertisement: Go to Widgets > Front Banner Right Side Advt and insert “PT Advertise” widget here. Go to Widgets > Front Content and insert the “PT All categories first video” widget here. Go to Widgets > Front Content and insert the “PT Latest video” widget here. Go to Widgets > Sidebar Front page and insert the “PT Popular Posts” widget here. Go to Widgets > Sidebar Front page and insert the “PT Featured videos” widget here. Now, lets learn how to add a new Video. Go to Video > Add Video and start adding all the information here. Select a Category. Or you can also click on “Add New Category” to create a new category. Custom Video Code: Enter the embedded video here. You can take the embedded code from youtube, vimeo, dailymotion, etc websites. Video Time: Enter the video playback time in this field. Video author Twitter ID: Twitter ID of the author who submitted this video. Video author Facebook ID: Facebook ID of the author who submitted this video. Image: Click on “Add Image” button to add the image of this video. Twitter: Go to Appearance > Video Theme Options > Video Detail Page > “Twitter Like” button show or hide. Facebook: Go to Appearance > Video Theme Options > Video Detail Page > “Facebook Like” button show or hide. Ratings: Use “wp-postratings” plugin for this. 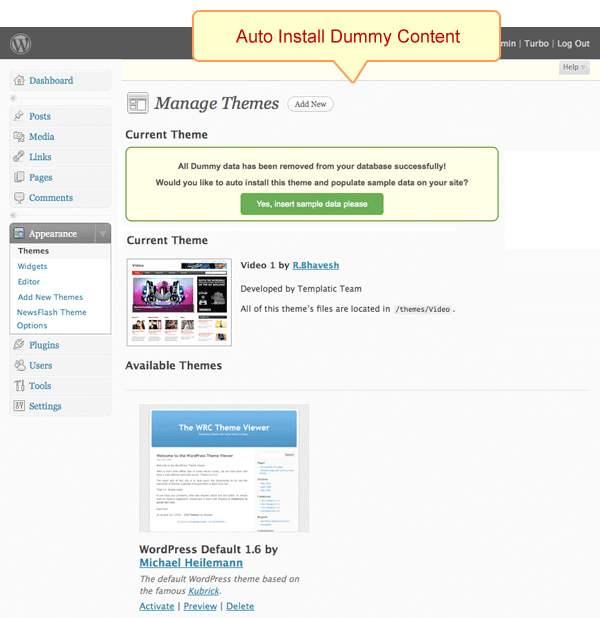 The theme which you downloaded already contains wp-postratings plugin. 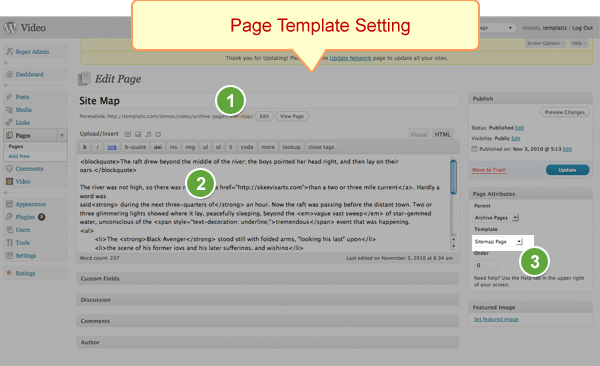 Just upload it to wp-content/plugins and then from WordPress Dashboard, go to Plugins and Activate it. OR go to Plugins > Add New and type wp-postratings in the search field. Now click on “Install”. 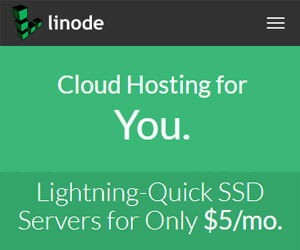 Just install this plugin and activate it and the rating system will automatically start. Go to Appearance > Widgets > Sidebar Video Detail and insert the “PT Featured Videos” widget here. Go to Appearance > Widgets > Sidebar Video Detail and insert the “PT Popular Posts” widget here. Now lets add a new page. Go to Pages > Add New. And finally select the template. Now go to plugins and just activate the wp-postratings plugins, you don’t need to do any other settings. Here are more premium and free video wordpress themes for you to choose from.